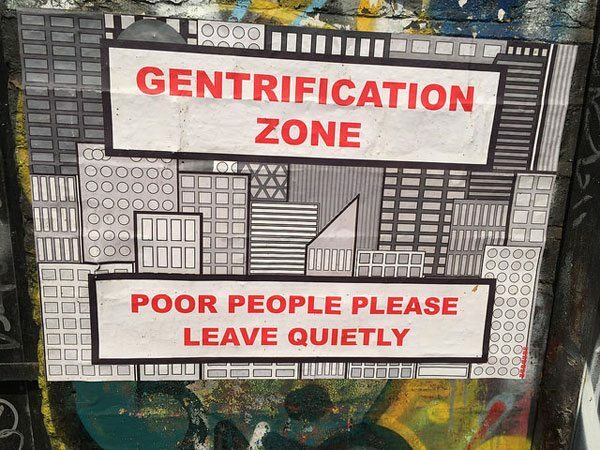 “‘Gentrification Zone,’ by SubDude of London.” Photo by Matt Brown. If you studied economics, you may have heard that rent control harms renters. And yet, in a growing number of cities, tenants are advocating for controls. Are they crazy? Or, is the story more complicated than economics textbooks suggest? Writing in Shelterforce, a housing and community development journal, tenant advocates Dean Preston and Shanti Singh make the case that there is more to the housing market than meets the neoclassical eye. It may be helpful to recall why rent control is, in the standard account, not supposed to work. Simply put, by controlling prices, the expected earnings of landlords fall. Over time, this is said to reduce construction, lower maintenance spending, and even reduce existing supply as some landlords convert buildings from rental to condos. Of course, if the supply of rental units falls or stays even and demand rises…well, then the price of housing should rise. It sounds so obvious…except that it is not. In economics, the core neoclassical assumptions vary greatly from what we see. A well-functioning market requires “perfect information,” but anyone who has ever looked for a place to live knows that real estate is riven with uncertainty. A well-functioning market also requires perfect competition, which, due to barriers to entry, doesn’t characterize real estate either. It is hard for tenants to organize and become their own landlords, which doesn’t stop housing cooperatives from being a good idea. Given the power differential between landlords and tenants, absent regulation, exploitation of tenants, particularly those with low incomes, is likely. In Portland, Oregon, where state law bans rent control, the city passed a law that said landlords can raise rents as they wish, but if the rent goes up by more than 10 percent and a tenant has to move, the landlord must pay the tenant’s moving expenses. Part of what drove public support for that law were landlords who doubled rents overnight, forcing families to move and spurring mass protests. A paper published last fall by Stanford professors Rebecca Diamond, Tim McQuade, and Franklin Qian, The Effects of Rent Control Expansion on Tenants, Landlords and Inequality: Evidence from San Francisco, purports to show that rent control in San Francisco has contributed to gentrification. Contributed, perhaps, but it seems clear that the tech boom, not rent control, has had the larger influence. One sign of this is that tech-centered cities like Portland and Seattle that lack rent control aren’t free from gentrification. The real goal of rent control is protecting the moral rights of occupancy.…If we think that income diverse, stable neighborhoods, where people are not forced to move every few years, [are worth preserving] then we collectively have an interest in stabilizing the neighborhood. Rent control takes many forms. Most promote tenant security while permitting landlords to earn a “fair” or “reasonable” return, as economist Richard Arnott has put it. It has been noted that in New York City, the two biggest construction booms occurred during periods of tight rent controls, suggesting that the supply-dampening effects of rent controls may be overstated. Indeed, a number of studies suggest holes in the standard account.